Makers of applications that locate drunk-driving checkpoints are misunderstood, defenders said Wednesday, a day after four U.S. senators called for smartphone makers to pull applications from their services. The applications do more than identify drunk-driving checkpoints set up by police, and the DUI (driving under the influence) checkpoint functionality actually aids police, said Joe Scott, CEO and founder of PhantomAlert, one of the companies targeted by the senators. “They’re misjudging us,” Scott said Wednesday. “It’s a safety tool. It’s approved by a lot of police departments. How is that we’re being sanctioned? It just doesn’t make sense." The iOS app PhantomAlert finds itself the target of lawmakers asking Apple to remove it from the App Store. The Association for Competitive Technology (ACT), a Washington, D.C., trade group, also questioned the request from Senators Harry Reid of Nevada, Charles Schumer of New York, Frank Lautenberg of New Jersey and Tom Udall of New Mexico. The four Democrats sent a letter to smartphone software vendors Apple, Google, and Research In Motion Tuesday, asking them to stop selling DUI checkpoint apps. The letter did’'t name the DUI checkpoint software, but Alert was one of several companies targeted, a Senate spokeswoman said. 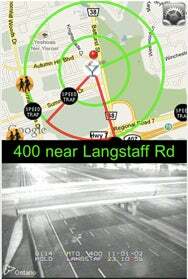 Similar software includes Cobra’s iRadar, Trapster, and Fuzz Alert. On Wednesday, the senators reported that RIM would remove the DUI checkpoint apps. “Drunk drivers will soon have one less tool to evade law enforcement and endanger our friends and families,” the senators said in a statement. “We appreciate RIM’s immediate reply and urge the other smartphone makers to quickly follow suit." But the apps in question contain publicly available information provided by police departments as well as reports from drivers, said Morgan Reed, ACT’s executive director. The social-networking and law enforcement information makes the apps very popular, he said. Asked if the senators’ letter amounted to the government compelling action of the smartphone makers, ACT spokesman Jonathan Godfrey suggested it did. “When the Senate majority leader [Reid] and his senate colleagues send a letter urging you to do something, implicit is that they can have hearings and examine legislative fixes if you don’t address their concerns,” he said. PhantomAlert, available since 2008, points out speed traps, red-light cameras, high-accident intersections, speed bumps and other traffic hazards.